Sir Patrick Stewart is an ally to the LGBT community, but he's not gay. The "X Men" actor had to clarify that after he was recently mistakenly outed by a British newspaper. In an article about actress Ellen Page coming out, The Guardian included a line saying "Some gay people, such as Sir Patrick Stewart, think Page's coming out speech is newsworthy." The error caused Stewart to share his amusement on Twitter. "Well @guardian it makes for a nice change," he tweeted. "At least I didn't wake up to the internet telling me I was dead again." Stewart is besties with openly gay actor Ian McKellen but married Sunny Ozell in Sepetember 2013. 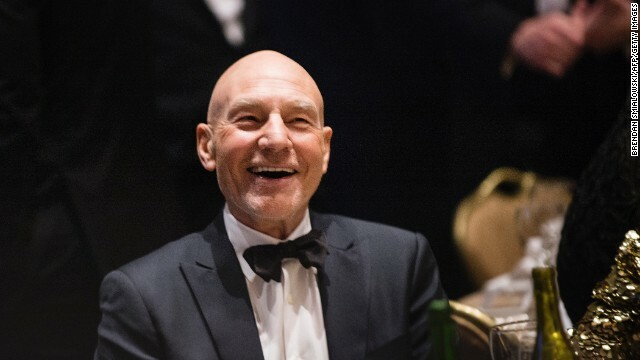 The paper later ran a correction stating "This should have read 'Some people, such as Sir Patrick Stewart, think Page's coming out speech is newsworthy." This makes me love Patrick Stewart even more. He strikes me as an incredibly confident man. He was fabulous in "Jeffrey" I would buy it. Never saw him have so much fun in a role. He's not gay, but he is an incredibly gifted actor. I'm sure that he had a blast doing that role. Wouldn't be as much of a problem if we didn't sensationalize everyone who actually does come out. Actually, it is simply another confirmation of the FACT the Guardian is just a worthless tabloid that is centered around the gay lifestyle and sensationalism of their dumb lead writer. Lighten up and get with the times, honey.